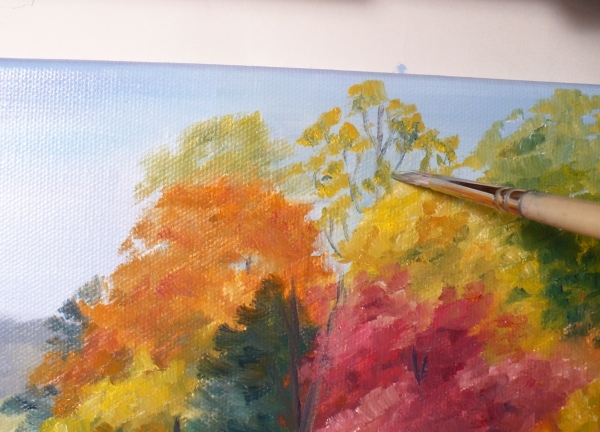 I needed a break between commission paintings and pet portraits, so out came a 16" x 20" canvas and my autumn colors! There is a hayfield down the road which I am sure was once used for cattle, but is now just for haying. In the middle of it is a clump of trees surrounding a small pond which is very picturesque when the leaves turn color in the fall. 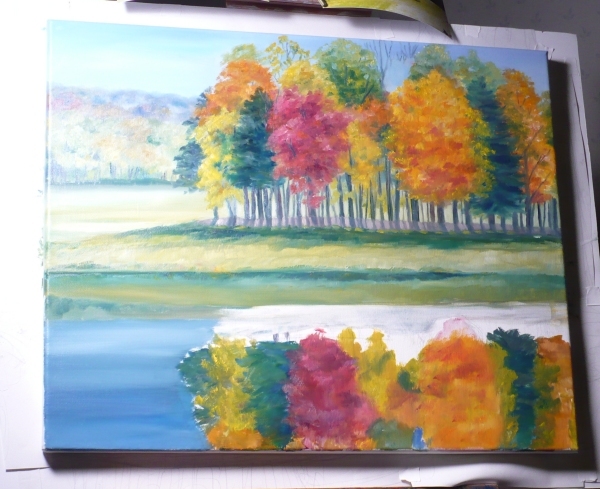 So, I decided to paint it and put the pond in front of the trees so the reflections of the colors would be visible. 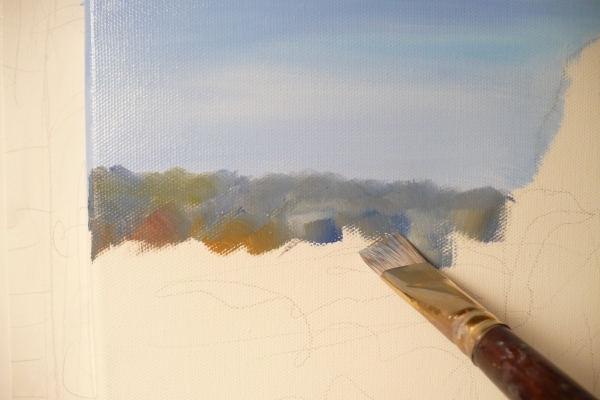 I start out with the sky as usual and then paint some grayed colors into the farthest hills on the left. Even the oranges, reds and yellows are very subdued. This will give the feeling of distance. 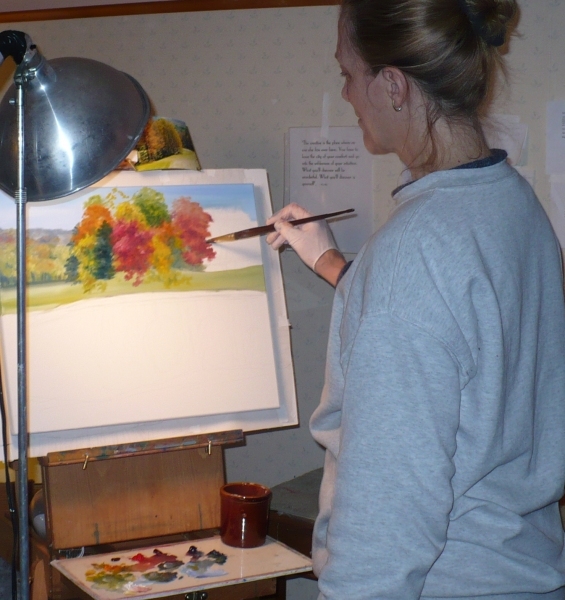 Here, I am painting some closer trees. You can see that the colors become warmer as the trees get "closer." 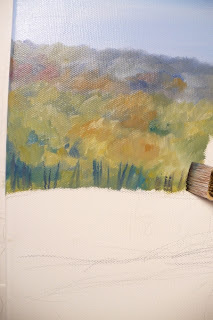 I am using a one inch flat brush for this painting. To put the tree trunks in, the edge of the brush works just fine. No need to change to a smaller brush. 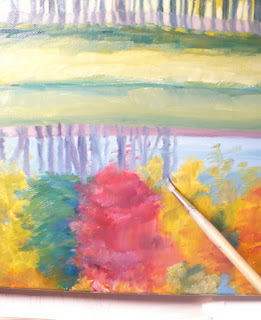 As I go along, I paint the wrapped edge of the canvas. It's much easier to do it while I have the correct colors on my palette. If I waited to do the edges after the painting was done, I'd have to mix all the colors again. 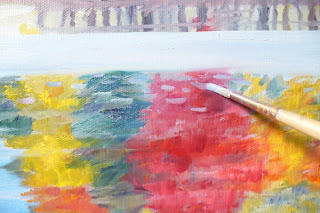 My palette consists of six colors: a warm and a cool of each of the primary colors - red, yellow and blue. 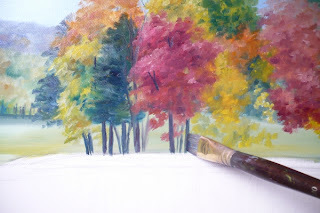 The next step is to paint the clump of trees which are the focal point. 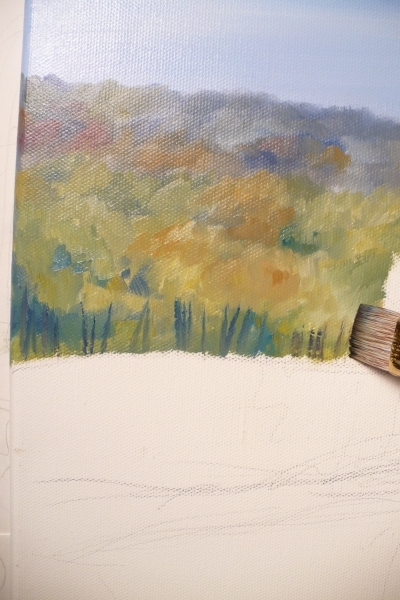 I'm still using the flat brush as it works great for foliage. One of the oaks is a beautiful red which makes a nice contrast to the other colors. 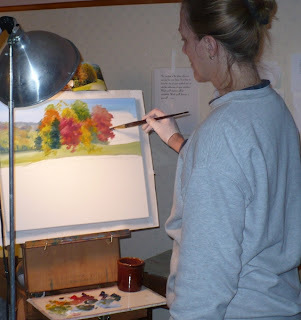 When I have the tree foliage in, I paint the trunks using the same method as the far trees only thicker as they are closer. If you look to the left, you can see those far trees. Notice how their subdued colors and much smaller size make them appear to be in the distance. Now I switch to a smaller round brush to paint the branches that show at the topmost parts of some of the trees. It's good to have a variety of trees with some full of leaves and others more bare. This creates more interest than if they were all the same. It's time to paint the pond with the beautiful reflections of the trees in the water. 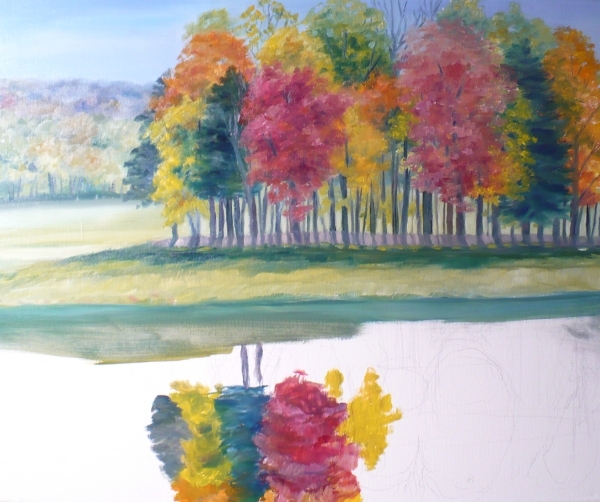 I start out just blocking in colors with the aim of keeping a mirror image of the trees. This means basically being sure the reflections line up with the trees above them. Here are the colors blocked in. 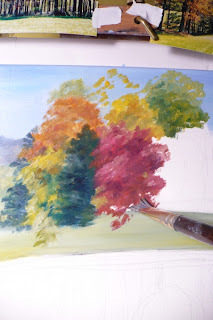 You may notice that I changed the right hand red tree to golden. This was because once the reflections were in, the four red areas including trees and reflections made too perfectly balanced an image which was a bit boring. We don't want boring! 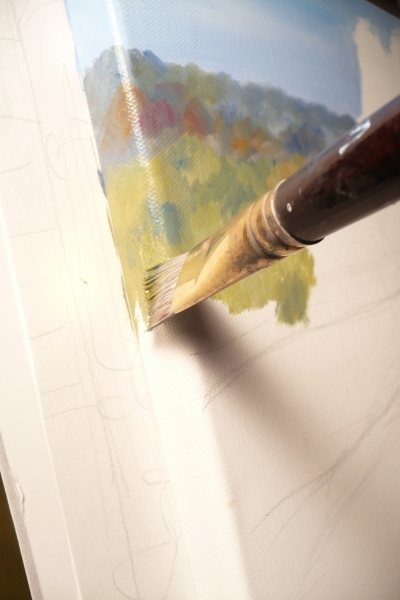 Using the same round brush I used for the tree branches, I paint some squiggly lines to represent the reflections of the tree trunks. Once again, the reflections should match up to the trunks above them. 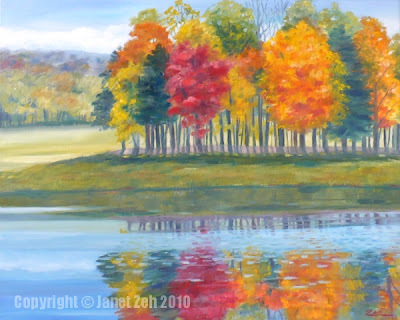 To denote movement in the water, I paint some long horizontal lines through the wet paint of the trunk reflections and a swath of pale blue sky reflection over part of the trees. If the water was smooth as glass, the reflection would not be disturbed and we'd have a mirror image. But I would like some movement. 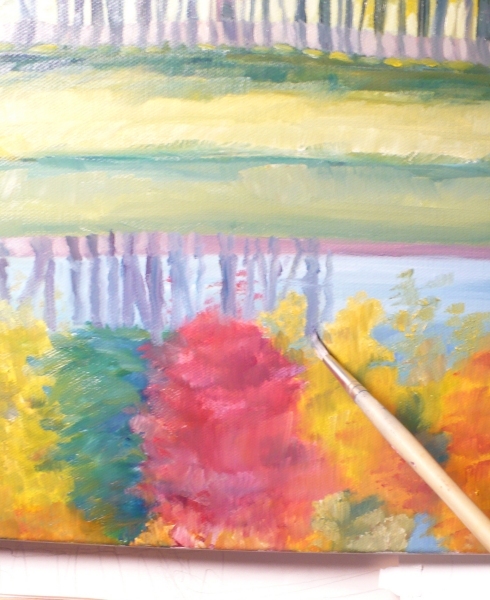 So I paint little choppy bits of blue sky reflection into the trees as well. Here is the finished piece! The sun shines onto the distant field. The trees cast both shadows onto the ground and reflections onto the water, the surface of which is ruffled by a slight breeze. Very nice, I enjoyed your tutorial, I am planing to paint an autumn scene with reflections..